Dining at Mockingbird single handedly convinced me that I need to eat in Oakland more often. With easy parking, no need for reservations, and a relaxed atmosphere, my friends and I shared a wonderful dining experience. Without a doubt, if this restaurant were situated in San Francisco, people would be lining up out of the door and reservations would be made months in advance. The chef, who is also a San Francisco native, brings her Italian-inspired California cuisine to the table. The dishes used ingredients familiar to me, but she prepared the local ingredients in a fashion that I had never envisioned before. For example, nearly every restaurant in the Bay Area has brussels sprouts on their menu when they are in season. One of my favorite ways to prepare them is to fry them in duck fat and then serve them with some salty capers and anchovies. At Mockingbird, the brussels sprouts carried a different pungency because the chef chose to smother them in lemon garlic confit aioli and blue cheese. I generally do not eat big pasta dishes when I go out, but I could not pass up the Meyer lemon tagliatelle with asparagus, herbs, and Parmigiano Reggiano. For the second main dish we decided to order the halibut, but were a little disappointed to hear that this small kitchen sold out of two seafood options by 7:30pm. Fortunately, someone in the kitchen went out and bought some wild salmon as a last-minute substitute. 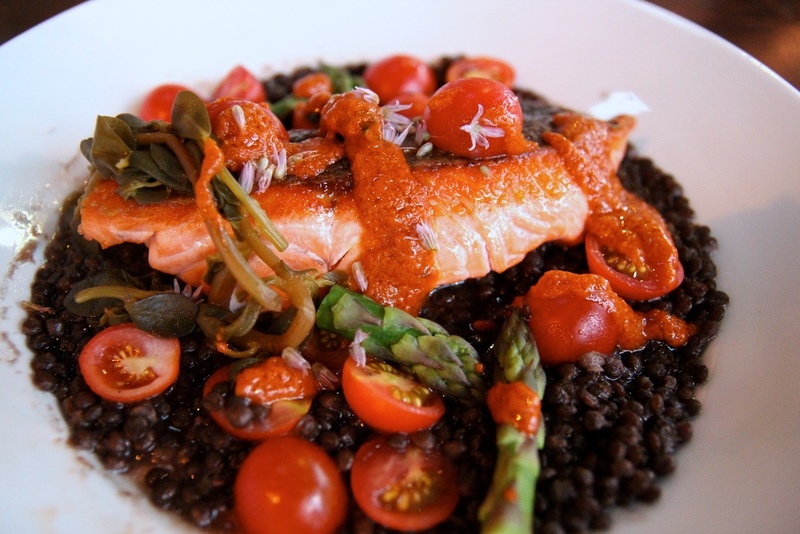 The salmon was paired with sweet cherry tomatoes and a spicy harissa sauce. 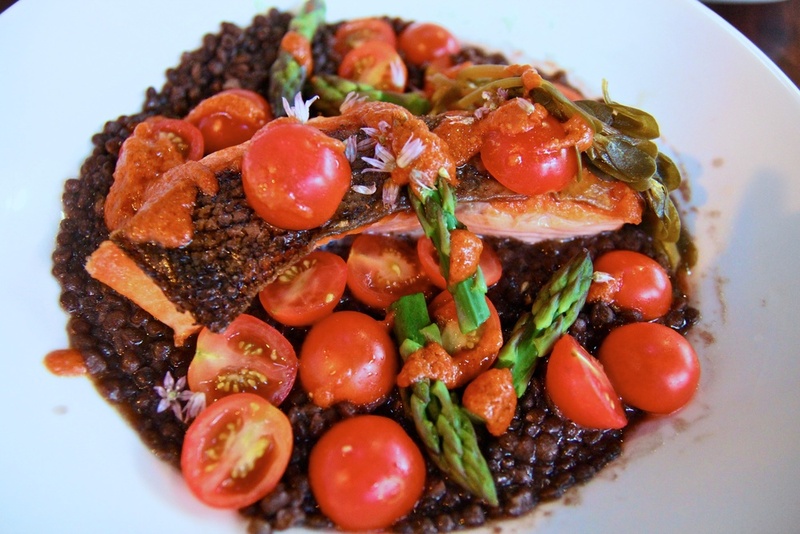 The blackened scaly skin on the fish mirrored the bed of black lentils that it rested upon, creating a tasty vision.